← Honestly, Hook is a Great Movie! 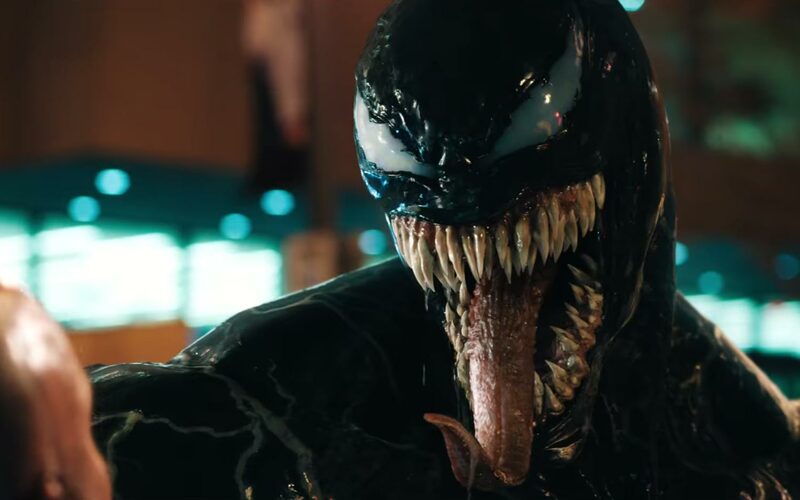 If Venom is successful — and there’s no indication it will be — the sequel practically writes itself. Rumors have been swirling about Woody Harrelson as Carnage, which I think is great casting. 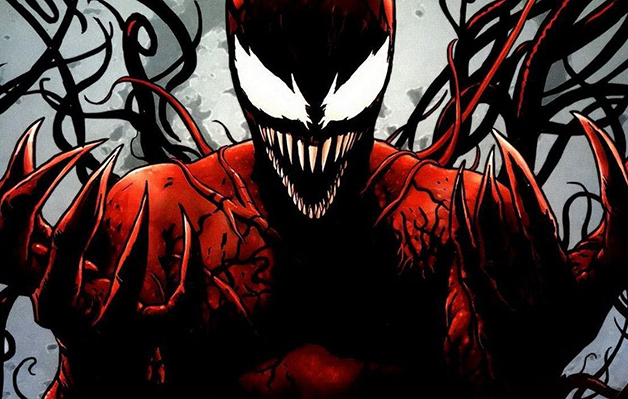 So obviously, just make a Maximum Carnage movie! Maybe drop all the unnecessary cameos and side characters, and just put serial killer Cletus Kasady into his symbiote and have him go hog wild through the city, killing everybody and creating a night of pure terror! Then the only option is sending Eddie Brock and the Venom symbiote to stop the out-of-control Carnage symbiote! I have no doubt this is what SONY is banking on. One of my favorite symbiotes is Hybrid, a 90s-era spin-off character who never amounted to much of anything. But he had a neat look, and a neat concept. Scott Washington lived in the Hood, but managed to work his way out into a real job as a security guard at one of those super-villain prisons. He ended up bonding with the four extra symbiotes from Venom: Separation Anxiety: Riot, Lasher, Phage and Agony, who had fused together into one single symbiote. Washington used this symbiote to be a badass, gang-killing anti-hero on the streets of Bed Stuy! But he barely even appeared in back-up features in Venom comics, so he was later killed off. We know that at least Riot will appear in the Venom movie, and perhaps some of those other symbiotes. Instead of using them to create Hybrid, a barely interesting character, SONY could instead go with the Mercury Team version of the characters. After Hybrid was killed off, Marvel took those symbiotes and split them up again, then gave them to an elite soldier squad. 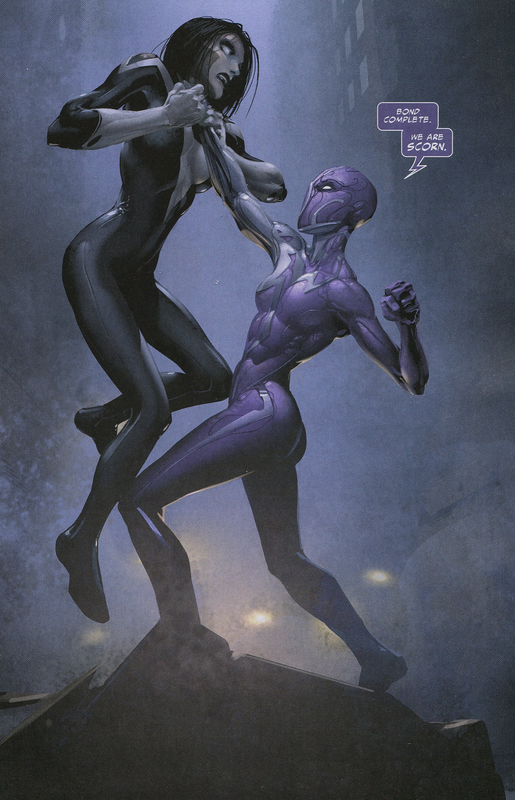 But rather than turn the squad into symbiote characters, they contained the symbiotes into weapon-specific uses. Like, one guy used the Phage symbiote as a super sniper rifle, while another soldier used the Riot symbiote as a sneak suit. I think this could be a pretty cool team to make a movie out of, putting the leftover symbiotes from Venom to good use. That hair needs to be in a movie! Scream has been popping up a lot on my blog lately, which is fine by me! Scream is probably my favorite of the symbiotes, almost exclusively because she has a pretty awesome look. Yellow and black with crazy whip-like hair? Hecks yes! After Venom and Carnage, Scream was also the third symbiote to appear (now there are dozens! ), and that she was a woman was a pretty cool move in the 90s. We know that Scream is going to show up in the Venom movie, to some extent. 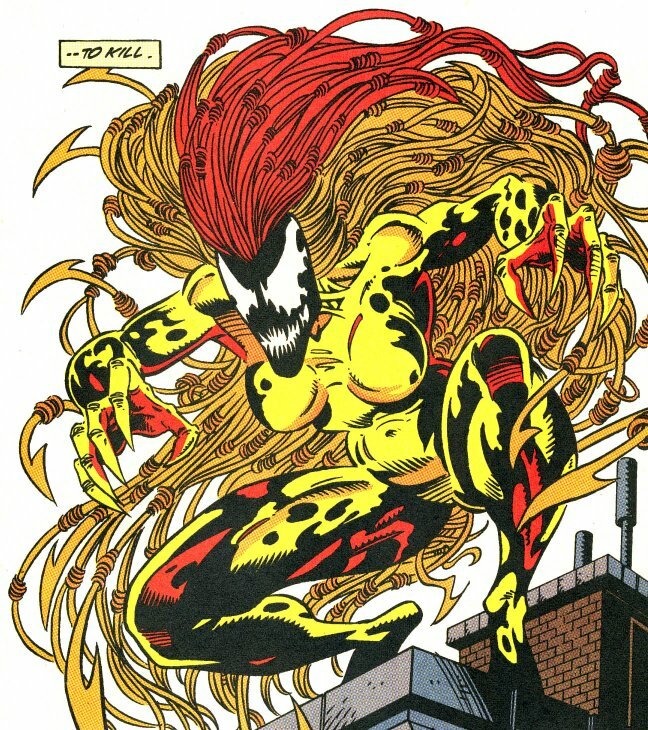 I’m hoping that the movie goes full-on yellow crazy female symbiote, and that she’s cool enough for a spin-off. SONY’s gonna want a piece of that female superhero movie success, right? In the comics, Agent Venom is what happened when Marvel wanted a new idea for a Venom comic, but didn’t want to just do Venom again. So they turned Venom into a soldier, making his costume look all manner of soldiery, like you see up there. To spice things up, Marvel hooked Venom onto Flash Thompson, a classic Spider-Man character who’d been transformed into a soldier who lost his legs in the Middle East. It was a neat use of both Flash and Venom and it lasted several years, but the upcoming Venom movie has prompted Marvel to go back to classic Eddie Brock status quo Venom. Still, a militarized Venom would make for a solid movie, I bet. Probably can’t give the symbiote to Flash Thompson though, at least not for a few years, when actor Tony Revolori can play a battle-hardened soldier instead of douchenozzle high school Flash Thompson. Jeez, I dunno. Just make a movie out of all of the symbiotes. There’s been, like, a bunch more since the 90s, and none of them stick around or make any sort of impact. There was Scorn and then Mania, now there’s one called Raze, and I think Poison was some alternate reality symbiote Peter Parker. Toxin was a symbiote for awhile, but he went the way of the dodo quite fast. There’s been two different planets of symbiotes, because Marvel keeps retconning their origin. Frankly, it’s madness. This is the Holy Grail of potential Venom sequels, people! When Venom is an amazing success and makes $2 billion, surely Marvel will trip over themselves trying to convince SONY to do a crossover movie, right? Then you’ve got Venom fighting Spider-Man on the big screen, just like its as always meant to be, and nothing like Spider-Man 3! Tom Holland vs. Tom Hardy! Black costume Spider-Man! Venom with the proper white spider symbol on the chest! And hey, if they make it that far, let’s bring back Carnage as the villain! 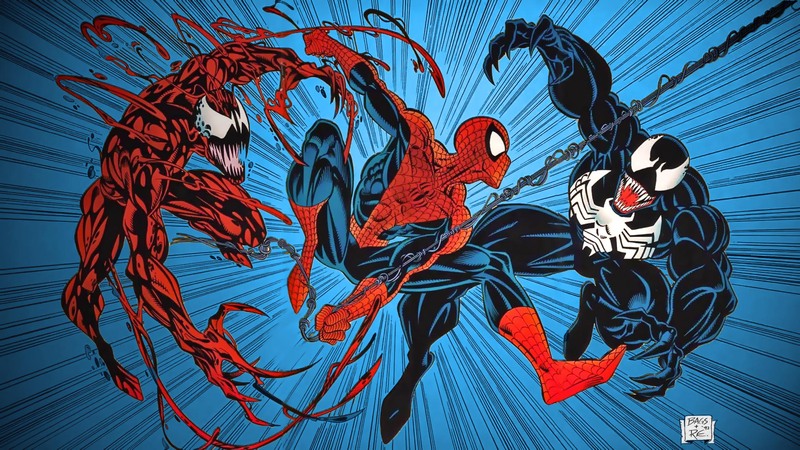 Spider-Man and Venom fight each other at first, then team up to take on Carnage! And Scream could show up as the female addition! And maybe Flash Thompson in the Lex Luthor role! And a scene where Venom looks up Flash’s computer files for small videos of Black Cat, Jackpot and Silver Sable! I’m on fire, baby! Somebody get me SONY on the phone! Posted on August 15, 2018, in Lists of Six!, Marvel, Movies and tagged Carnage, Hybrid, Scream, Venom. Bookmark the permalink. 1 Comment.